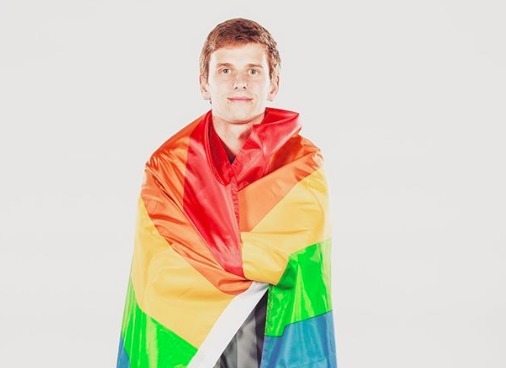 Pro soccer player Collin Martin has come out as gay. The 23-year-old athlete made the big announcement on Twitter this morning, just hours before his team hosts their Pride Night tonight against FC Dallas. Martin has played FC midfielder for Minnesota United for the past two seasons. Before that, he played four seasons with D.C. United. He is only the second openly gay player in Major League Soccer’s history. (The first was Robbie Rogers back in 2013.) And he is the only openly gay active player in any major pro sports league in the U.S. The Football Association recently the launched its “For All” campaign which aims to include people of all sexualities, ethnicities, abilities and disabilities, faiths, genders, and ages. The start of MLS is right around the corner ?. Can’t wait to rock these dope new kits! #year6 #loons #17 ? Came down to Florida for Thanksgiving this year. Jim brought me fishing in the mangroves and I caught this Sheepshead ? Get ? ?, it’s game day! #COYL #MNUFC #17 ? Soccer and hockey players are the hottest players. It’s a pity none of the thousands of European soccer players have the guts to come out as gay or as in favour of lbgt. Soccer is Europe is like a religion attracting many fanatics who are amongst the foulest mouthed, most insulting, violent fans you are likely to find. Alcohol plays a big part in it. Unlike rugby, families no longer feel safe going to soccer games. At rugby supporters from opposing teams often watch from the same stand. And homophobia is frowned upon. His IS super cute! And I bet he has a beautifully sculpted body, but . . . with a small wang! MY experience with gingers is that they are well endowed. That said, I wouldn’t be all that concerned with the size of his member. If it works, I’m fine with that. There are much more important attributes I’d be interested in. And I’m sure I’m not alone in thinking along this line. Mick406… Some stupid comments should be kept to yourself. I assume your meanness is to compensate for YOUR “short comings”. I’d love to play ball with him…and by balls I mean his. Good for him. WTG Collin! “Super” cute is stretching it a little. The words Trailblazer and Hero come to mind. “Super cute”? Excuse me, but did a 12 year old girl write that headline? It’s sad he is the only out male athlete in any of the major sports. UM, Robbie Rogers has been an out soccer player for several years. He played for L.A. I am confident there are many more, either gay or bi. At some point in time, it no longer will be necessary to announce one’s sexual orientation. This is such a waste of time and emotional energy. People must be allowed to live as they are without feeling compelled to out themselves to the world. I realize athletes do this in order to encourage others, even if that means to self-identify as queer and embrace it. I have been out and gay for fifty years. Sadly, I believe there has not been enough progress. Congrats to him for his bravery. Perhaps more in MLS will follow his lead. He’s very cute. I hope he doesn’t sell himself to some rich old Hollywood congresswoman the way Robbie Rogers did.